For those who may not be familiar with the show Make48, it’s where teams of all ages, genders, backgrounds, and places develop brand new ideas in a weekend invent-a-thon where they have 48 hours to plan, prototype, and pitch an idea for prizes and licensing potential. It is a valuable resource for anyone and everyone to gain insight into the innovation community. 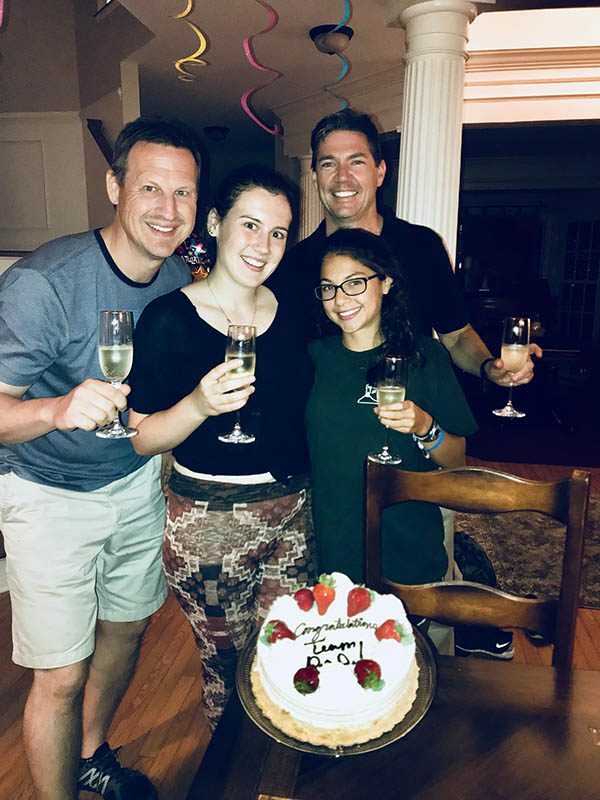 David McCutcheon, full-time teacher and inventor and avid listener of the podcast, has wanted to be on Make48, so he brought together his longtime friend, Erik Phelps, and their two daughters, Brynn and Maria, to make up Team D.a.D., Dads and Daughters, and auditioned for the show and made it. 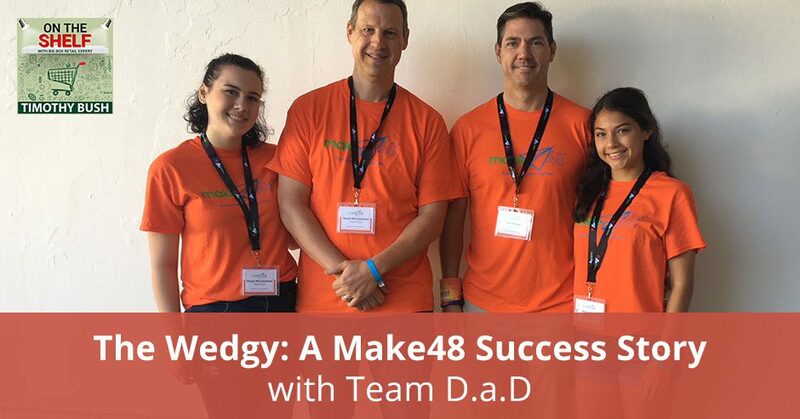 David, Erik, Brynn, and Maria recount how they worked their way through the 48-hour challenge and had an awesome time creating a product called the Wedgy with patent that’s going to be on the shelves of major retailers. Let’s go back a little bit in 2017. Joe Tarnowski, I know you know Joe because he’s a panelist on our Flash Topic podcast. Joe had an ECRM session here in Orlando and he had somebody at the session whose name was Tom Gray. Tom is a Cofounder of the program, Make48. Joe called me up and said, “Would you like to come down and interview Tom for your podcast?” That sounded like a great opportunity to me. Making products in 48 hours and getting them on the shelf, that’s what we’re all about. I went down and met Tom and we had a great time. He’s a great guy. After I met Tom and he was on the program, he introduced me to Rich Brull, who was one of his partners. I talked to Rich more about Make48 and then also about what they’re learning from the process and the actual TV show and people producing products in 48 hours, the good and the bad. That’s a great interview as well. Be sure to go back and listen to both of those if you have them already. Tom was on the podcast, Rich was on the podcast and then I have an audience. His name is David McCutcheon. David had already reached out to me several times because he’s an inventor. He had a couple of things going on that he wanted my advice on and so we’d already talked. He’s an avid listener of the podcast and he heard both Tom and Rich on the show. He wanted to be on Make48, but you need four people. We went to his longtime friend, Erik Phelps and Erik’s like, “Let’s do it.” They’ve got their two daughters involved. Their daughters are very similar in age and Dads and Daughters was born. They went and they auditioned for the show. As you can imagine, they made it on this show. They had an awesome time and produced an awesome product. Here’s the cool thing, Joe thinking about me and thinking about people for my podcast said, “Do you want to meet Tom?” I did. David is a listener of the podcast. Here’s Tom and he decides, “Let’s be on Make48.” He gets a group together, including their daughters and they go auditioned, got on and they produced a product. That product is going to get on the shelves of major retailers. They now own the patent on that product. Because Joe was thinking about me and made that introduction, David and his team now own a product with patents that are going to be on the shelves of major retailers. The daughters are just starting out in college, but they already are patent owners. How great of a circle is that? Think about it. What selfless introductions can you make? Joe’s not going to get anything out of this. He just wanted to help out the podcast. Joe, many thanks. I’m not going to tell you how they did. I’m going to let them do that. I’m not going to even tell you what their product is because I’m going to let them tell you all about it. Let’s get right into it. Welcome to Team D.a.D. from the famous show, Make48. Big Boxers, we have four people on the show and they make up Team D.a.D, which stands for Dads and Daughters. We’ve had several people, Tom Gray and Rich Brull, on the show for Make48. We had Tom on the show back when it was rolling out. David, that’s probably the podcast that you heard. I think you’re at the National Hardware Show. No, we were at ECRM event. Tom was there working with the folks at ECRM to see how they could collaborate because ECRM puts a lot of people together with retail buyers. We were on site there. That was one of the very first on-site interviews I had ever done. It was a popular podcast and I think that’s what you heard that put the bug in you. My wife has a rule about my inventing and that is as long as it doesn’t cost any money, I’m allowed to do it. You spend money in secret then. At the time it was like, “You can send an application for free and I hope you get picked.” It wasn’t free. We had to fly out there and you stay in a hotel but since we were going to be in a competition, she’s okay with it. You hear the podcast and you do what? Big Boxers, if you’re not getting this, we have two gentleman and their daughters that make up Dads and Daughters, which was their team on Make48. How did you bust that out and say, “I think we should go for this show?” How did that happen? This is Erik. Maria and I were pinch hitters. David abides by his brother who was a marketer. His brother started a new career as a teacher just like David, so he was able to get off. Fortunately for all involved, he came and brought us into it and we decided to go for it. We made a trip to Kansas City and joined the competition. The fun part is that the girls have been friends since they were two. This is a long-time friendship and everybody is getting along on the team except for Erik and me. Maria, what was the first that you heard of this and were you skeptical? My dad laid out the plan. I don’t recourse to questions. It was more about, “We’re going,” and I was like, “Sounds good.” Brynn and I were both free, unaware. We didn’t know what to expect at all. We just run into it. We’re going to have some fun and we did have fun. That would have been a cool experience that we definitely will never have taken on ourselves if we have not been asked by our dads. We’re glad we did it but definitely very unexpected. Brynn, do you remember it that way, carefree and all that? Do you remember it differently? I remember originally my dad had asked me and my uncle. Honestly, when he was making the video, I thought we probably won’t be picked. What are the chances of us getting to do this? When we found out that the four of us got to go, we didn’t know what to expect but I was pleasantly surprised that we ended up being part of the competition. Was there anybody that was camera shy? It’s funny because you watch reality shows and you say, “How could they say that in front of the camera?” At first, when you have all the cameras in your face, you feel awkward in front of them. You feel like every word is being captured, “Do I have a funny face?” After several hours you start to ignore them and you can tell watching the show that you can see us start to loosen up as the show goes on. They are adapting to it and then eventually, you’re so tired from working so hard on it that you just don’t care and you get silly. You’re so involved in the task and so intense. We’re focused the whole time. The cameras, we’re almost like, “That’s fine. Do whatever you want to do but we’ve got our job to do.” We’re brainstorming. We’re working on our prototype and so it’s secondary. The Wedgy: When we found out that the four of us got to go, we didn’t know what to expect but I was pleasantly surprised that we ended up being part of the competition. Let’s back up a little bit because I’m sure that there are some Big Boxers that have not gone back to the Make48 podcast. Make48 is a reality TV show. Who wants to break down the show? What is it all about and why do people go on there? The competition is a combination of the shows where you have to make a dress in 48 hours and you run and get supplies and make the dress. Also, it’s like a Shark Tank where you have to pitch an idea. You get 48 hours from the point where they announce a category to come up with your idea, get the supplies from Ace Hardware, come back, make it and there’s all the part of the video. Brynn and Maria talked about the video and then pitch it in front of the audience. It’s combining all those factors and you only have 48 hours, that includes building prototype. It’s a lot to do in a short amount of time but fortunately, they have tool techs which are folks who have expertise in welding, cutting wood, shaping things, making prototypes out of 3D printing. You’ve got a lot of folks to help you get through on that period of time. You get there, you get in your group. They have a category that they want you to focus on. They give you that category and then immediately you as a group, as Team D.a.D have to come up with the idea, the thing that you’re going to make, the product. Part of their philosophy or the way the competition works is you don’t have to come in with any building skills at all. It’s about the idea, what kind of idea can you come up with and the tool techs will help you from there. That’s probably the hardest part because something creative and new, you have to think outside the box, think of something that’s never been thought of before. Once you go to them, you can explain it and they can make it. That’s what I always say when we’re watching some HDTV show. When a yard comes together in what seems to be fifteen minutes and we always like each other. If we had contractors and we had people bringing in plants, it seems easier. It’s very handy that you have guys and people that can help you make it. David, when you and I first met, you had this little invention idea for a vacuum cleaner. I got the idea that you’ve been thinking about that for a long time. It had been on your mind and you’ve been thinking about it for some time. I’ve been doing this for a couple of years. I’m a full-time career teacher. I’ve been doing this for fun, thinking about things outside the box. I’m trying to submit ideas for licensing, but I did have the vacuum cleaner. You can see them at CanisterClips.com. I was able to make some and put them up for sale. The reason I was asking is that when people come to me and they have an idea or they have a product, it has been this long toil of thinking and process. Here, you get a category. You have to come up with a product, get it produced and pitch it all inside of 48 hours. How does that contrast with the long-time thinking about a product? How did you make that switch to, “We’ve got to come up with the product?” Brynn, why don’t you weigh in here and say what was that initial brainstorming process? One of the things that we had practiced beforehand was some different techniques of initial brainstorming and then discussing. The first thing we did is we all sat down and wrote down problems or things that we wish were better and were more outside. The category was outdoor entertainment. Once we had that, we looked at ways to fix the problem. We had to go with instinct. We had several different ideas and ultimately, it came down to which one do we think is best. We didn’t have the opportunity to explore anything too deeply. I can attest that for my dad’s other inventions. He spends hours and hours out in the garage tinkering around. One of the challenges was having to take an idea and go with it and not knowing if it was going to work or if it was going to come out right. We’re lucky that it ended up being so successful. The Wedgy: We called it the Wedgy. It seemed very silly and fun, but it ended up being a powerful branding tool. Maria, was the brainstorming session pretty congenial or was there shouting? I don’t think at that point there was much tension. It was like throwing your own ideas. Tension build a little bit later when things are getting more intense timewise. We all share our ideas, bounce off each other and build on them. It definitely wasn’t one single idea. It was a lot of work put into ideas putting on together. It was definitely an interesting experience with our dads. The relationship that we have with each other, being close family friends, made it much more of an easy process. I like how you started the beginning of your sentence with, “At the beginning, there was not so much tension.” We’re going to get into that. You guys are brainstorming. Erik, how many ideas did it come down to? We started brainstorming the problem. For example, when you’re around a fire and the smoke blows in your eyes, can we fix that? One of the other teams tried to tackle that. As you watch the show, you will see what they did and how they were able to try and fix that. That was interesting too because several of the problems we brainstormed, other teams happened to work. Some of the ideas like bees getting in your food or your drinks, you name it. We ended up with a few ideas. One of the goofier ones I was advocating for was some beach umbrella that would sense where the sun is. You put it in the ground with some stake thing and then it would move as the sun move. That one got discarded, thankfully. They have folks rotating around, some of the tool techs, Bob and Rich. They’re wandering around talking to you. Talking to them, once you say it out loud and talk through it, you can realize that sounds dumb or this is promising. They will give you feedback and eventually, we went with it. It’s funny because initially when we have the idea, I don’t know quite how to picture it, but we used the paper that you use to brainstorm. We use that and kept flopping that around to explain our product. Half of them were like, “What are these guys doing?” It took a little while to form and then eventually, they realized this is a quality product. This is a great idea. David, was there a product that you were advocating for before you all landed on the final product? I don’t think so. That wasn’t competitive among us. That’s where the collaboration is and because a lot of the inventing that I made in the past was made by myself in the garage, it was a lot better because of all four for us. We like to point out that the Phelps love the beach and the McCutcheons love the mountains. We poured all our ideas in there so that made a big difference. You guys come up upon a product. Before we say what the product is, what does that solve? That was the big question people keep asking us. One of the problems we had was trying to carry all the stuff to the beach. You need an umbrella for shade, towels and beach chairs. The ones that exist now don’t fold up very well. Trying to carry all that stuff, we felt like if we had a product to be both an umbrella and a chair that was easier to carry and that was easier to transport in a car, that would be something adventurous. An umbrella chair, so to speak. It’s more elegant. If you’ve ever seen the chair umbrella that exists now, it’s a chair and an umbrella stuck in the arm and trying to carry it around and getting the shade is a problem. What’s interesting is after we made the product, other folks who were circling saw different problems that are solved that we hadn’t thought of. One was reclining on a hill. If you’re at an outdoor concert, your typical chair you’re trying to set it up on a hill, you’re off balance and you’re blocking people. Our solution, our product works well in that environment and that’s something we hadn’t thought of until one of the folks wandering around and the judges brought that to our attention. 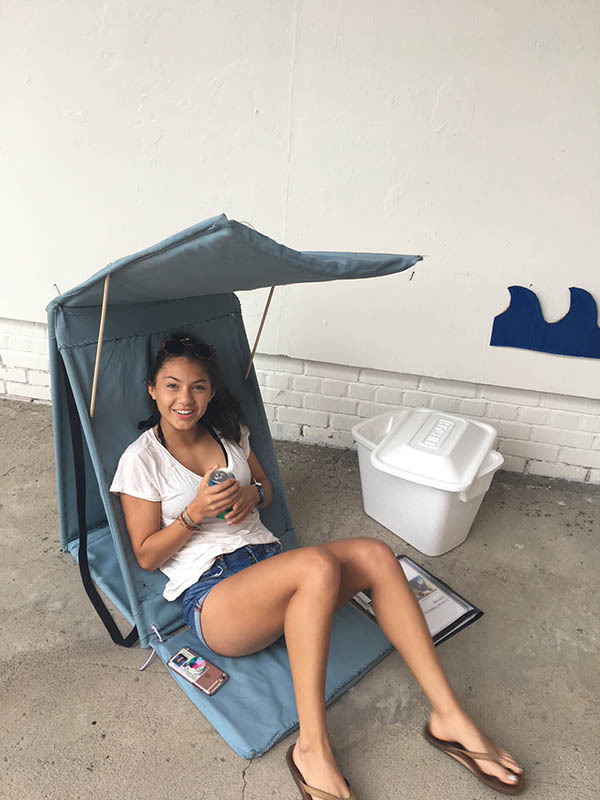 You have a multi-use chair that folds up that you can sit in and it has a top on it so that it could give you some shade. You had to name this thing. Who came up with the name? I think that would have been me. We kept calling it the wedge chair. It’s how they were describing it to people. 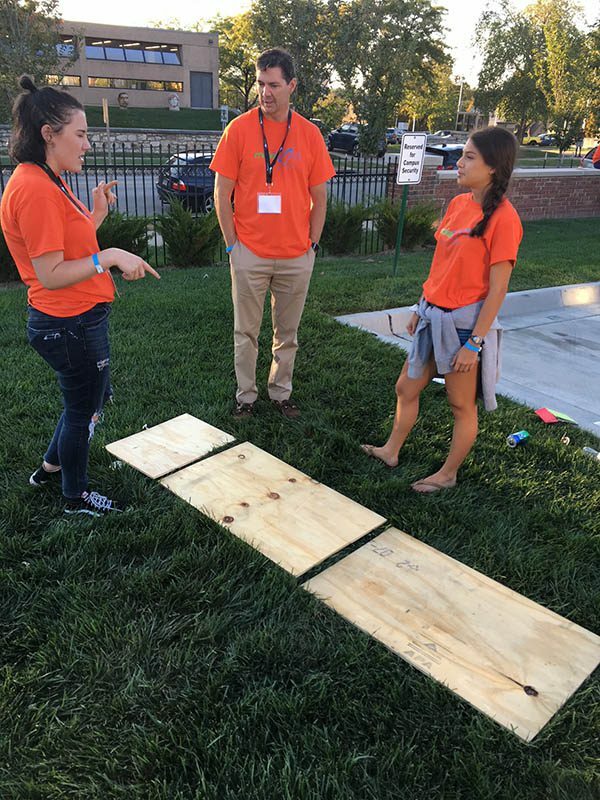 When we were trying to explain it to the mentors and these other people, we kept calling it the wedge chair. I don’t remember the exact moment that it happened, but I think I called it the Wedgy. That’s how we ended up with the name. At first, it seemed very silly and fun but it ended up being a powerful branding tool. People remember it and people love that. If you can get a name that resonates with people and that they remember, that’s key. Your invention is your chair-umbrella and it’s called the Wedgy. Where are we at with this Wedgy chair at this moment? The Wedgy: It was still a little bit choppy and hard to move, but we’re modeling and showing the product and my dad took over the talk. This goes back to your question before about the process and for people out there who are inventing. It is one of the products that’s being produced for the show afterward. The first five episodes are the competition part and the second five episodes are the products being made. Getting to your question from before, the 48 hours was very quick and very intense. There’s one tag word with inventing. It’s, “Slow, slow, slow.” It takes a long time. We had one prototype made and that took six months. We’re told we could go away for the second prototype. The prototypes are made in China. We haven’t seen the second prototype. We haven’t got any update on it. We’re waiting to hear what it will come back with. It has been a long process after the initial phase. One thing about the Make48 that’s great is you can do so many iterations with all the tool techs. That’s where you can improve the product. Once we got out, we’re waiting several months to get one iteration. Part of your question was calling it the wedge chair, umbrella chair. We settled on a 3-in-1 lounger. It is similar to a wedge shape and now there’s been some evolution. If you think about a simple triangle or wedge shape, when you lay it on one end, it’s more of a lounger. 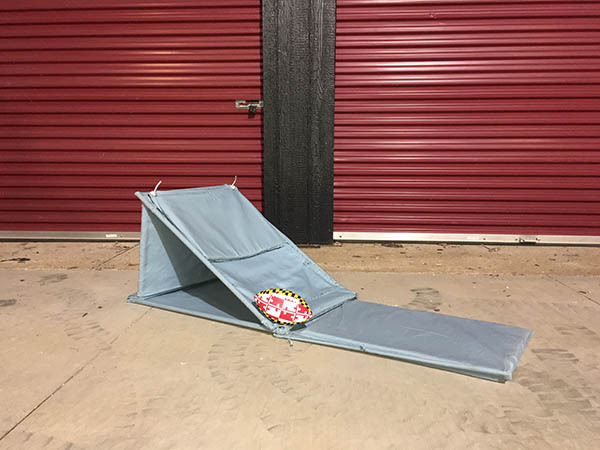 When you set it up, it’s more of a recliner that you can then flip a cushion over and serve as a sunshade but then you can open it all the way up and it’s like a cot or you can lay out it looks like a long towel. There are three different positions and then all the different uses with these positions that made the product unique. You can’t see a product quite like that and a lot of folks like the versatility of it. The fact that it folds flat because it doesn’t have legs, the initial prototype folds flat, that is a feature we wanted to keep as we went through future iterations. When you think of the regular chairs and you try and stack them, it doesn’t work very well on the back of a car. If it flattens out or only a couple inches thick, it’s easy to stack them. That’s something I learned about listening to On The Shelf. If you’re going to get into Costco, it’s going to be sitting there in the palette. It’s going to have to be packaged in a box. That was one of the real tractions was on the shelf, this does not take up as much space that’s three inches thick. It’s going to be much more efficient for putting it out there. You have to decide who your customer is. You’ve got to figure out where those people shop and then you’ve got to figure out how that company merchandises and does that product fit into that way. The fact that you guys went down there, you created a product out of nothing, you did it all in 48 hours and you came out with an actual product. Irrespective of where you might fall in the overall contest, that’s a pretty big accomplishment. A funny story and I’ll let the girls chime in about, they always have tool techs but they were lacking one key skill that Brynn had shifted on. Brynn, maybe you can talk about the skill you had to apply and how that has helped make our product. We welded the frame initially and there was an amazing tool tech who helped us with that because none of us are pro welders. When we were trying to create a working prototype, we realized we were going to need to somehow upholster this chair that we were creating. We went to Michaels or Joann Fabrics or somewhere like that and we’ve got a bunch of fabric. I had some very limited sewing knowledge, so I began to sew the cover on this chair so that you could sit in it. Luckily, once I and Maria were both burnt out and went back, one of the tool tech’s wives who was volunteering also helped because there was a lot of sewing. Once the frame was welded, we’ve got to completes all that so there was a working prototype. That definitely helped me get better as a seamstress. That was something I did not have to expect to do. Our prototype ended up being somewhat functional even though we do it together in 48 hours. David and I, it was 3:00 AM in one of the nights and we have our limited home economics skills from seventh grade. We wanted to put two simple pockets, so we can put a dowel and hold the sunshade up when you flip it around. David was like, “This is going to take us half an hour.” At 3:30 AM, we’re still trying to do it. We finally stand it up and magically, it was level. I don’t know what had happened, but we set it up and we went home. Luckily, this isn’t like your reality show where people are sabotaging each other. The folks who participated were all helping each other and it was a very collegial environment. We were able to leave our chair sitting there up in a very precarious position and not have to worry about someone coming in doing some silly reality show thing and messing it up. That’s another thing I want to point out. The environment of the show was great. These guys did a great job creating a positive environment and they are very focused on the inventing process and not trying to make compelling television through some antics. There’s enough room for everybody to be successful. You did your pitch. Tell us how did the actual pitch go and who was the lead pitch person. We passed the baton over to my dad, Erik. He had some more business experience than the rest of us. He did the pitch, he took that over and Brynn and I were flipping around the prototype to show exactly what it’s supposed to do. It wasn’t exactly the most functional at that time. It was still a little bit choppy and hard to move but we’re modeling and showing the product and my dad took over the talk. Erik, how did the pitch go? 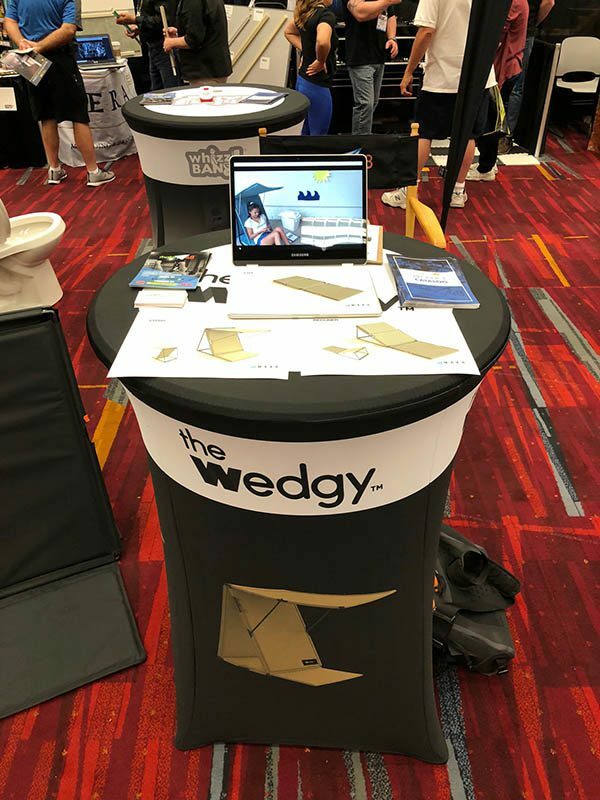 The Wedgy: All the different pieces came together and all of that combined to sell it. The judges and the audience saw finally what our product was. It went amazingly well. We rehearsed it because the Wedgy, at the time, had two cushions and fabric on all three sides. It was hard to tell the way to fold it. We practiced folding it to make it smooth because if you didn’t pull it outright, you get confused. We practiced with Brynn and Maria on the opposite side of the stage and we flipped it one way, hold the sunshade and bring with the lay-in and flipped it around. We had it down well so that when we got on stage, it would be smooth. We had to concentrate on making it look easy to use because, at the time, the prototype was a little tricky. Since then, we made adjustments not just to improve and solve some of the design challenges that became apparent but also to make it easier for the person who buys and use the chair to understand how to put it into different configurations. At that point, the Wedgy was a little bit more beat up because we have been opening it and closing it, showing it and putting it everywhere. We were a little bit afraid that our lack of sewing abilities, something will break at some point. We have to be very gentle with our demonstration of how to use it. I was afraid that it will be ripped and that it will criss-cross all over the place. Luckily, that did not happen. I want to hear from each one of you your thoughts on one or two things that you learned. What you guys did and what you guys went through can be applied to many different aspects, especially in business. There are many times you have to get together, you don’t have a lot of time, you’ve got to come up with a solution and you’ve got to brainstorm it out. The fact that you have already been through that successfully is awesome and will go a long way. How did it turn out? Where did you guys place? Let me picture one more thing about the presentation because when we were up there on the stage at last day, Sunday, we broke up our different task. Brynn and Maria had the task of creating a video. At this point, people would have been able to see the video. I think the video is a hit of the show. Erik and I haven’t seen it. We had explained to the girls that here’s what we’re thinking. We talked about it together and they went off. We went up on the stage and we did our manipulation and then they played this video. Erik and I were beaming with pride because we couldn’t believe the incredible job the girls had done. We had not even seen the video until they put it in front of the 150 people. We were just blown away by what was done. It was funny, it had jokes in it. That was a huge part of the presentation. To answer your question, we won the competition. Of the teams from the twelve different states that entered, the top three receives licensing deals. We were looking around and there were a couple of products that we liked. One of them got third and the other got second. I’m looking around and I’m like, “We might actually win this thing.” When they announced us, we jumped up and David cried tears of joy. Some of the tool techs were crying. It was amazing. I think the whole story of the Dads and Daughters touched a lot of the Make48 staff. You’ll see it when it’s announced. There were tears around the room and it was just incredible. After you’re that tired and you’ve worked that hard, you’ve got so much emotion. You’ve expended so much energy that it was a great release and it was a great feeling to go out there and claim first place. Congratulations, I don’t know. You guys couldn’t tell me. When we saw each other at the Hardware Show, you weren’t able to tell me what happened. I’m hearing for the first time, I have tears of joy myself. I was thinking to myself, “How did they not know that you guys got first?” It dawned on me that you couldn’t tell me before then. Thank you. The thing is with the tears of joy, you heard them announce the third, you heard them announce the second, your chances are dwindling with each one. It’s a dollar or nothing at that point. A lot of it was the story that the girls produced in the video. Brynn and I thought it’s funny how impressed all the adults are with our video. It’s a little 30-second video that we cut together on iMovie in about half an hour. It was not a very large production. In our days of magnet high school programs, we had done many documentary movies and this is not that at all, but we enjoyed it. It’s so easy when you know what you’re doing. We’re down to two hours before the 48 was off and they’re like, “We’re going to do this.” They hit the deadline with time spared. All those contributions sealed the win. I don’t think any of us could have predicted how well the pitch went. All the different pieces definitely came together and all of that combined to sell it. The judges and the audience saw finally what our product was. Today, the story is a huge part of why people get engaged. Buying is emotional. The more people can identify with what you’re doing and how you’re doing it, how it all came about and the struggles, how it made you closer and the whole story behind it, it matters. It’s one thing. Retailers can go get products from anywhere. It’s not like it was years ago when they relied on people like us to bring them cool products. Now they go to Alibaba or Canton Fair, wherever they want to find cool products. What they can’t get and what they always want is they can’t get your company, they can’t duplicate that. They can’t get your followers. They can’t get the people that are interested and that follow you on social and they can’t get your story. Those are things that they can never get and so they’re looking for those things. Retail buyers are looking for a good story, a good company behind it. Based on the fact that that was a big part of your pitch just lends itself to the fact that it will, at some point, also be a good part in how you resonate this with buyers. Now you are on the other side and you alluded to the fact that it’s a slugfest to get a product produced and you guys are still in that part. I saw your prototype when we were at the Hardware Show. Speak a little bit about the pitfalls of production. There’s a lot of Big Boxers out there that are producing products and it’s hard. What have you learned and what advice would you give to people that are in that production part of the process? The Wedgy: It’s amazing what can be accomplished in a short period of time when you get folks together and put their minds together. For me, one of the things that we were able to do that much was the product testing and getting ideas of how people feel about it so we can make changes. We don’t know how people are going to react. The revised Wedgy is different. I don’t exactly know how do you do the testing to see how people feel about things. That’s definitely one issue. The other issue is about that whole process of getting the prototype made and taking so long. When the first prototype came in, we did not order the prototype in black fabric. They didn’t want a beach chair in black fabric but that’s what came in. That’s what we had to go with in the Hardware Show. People are looking at it like, “You’ve got a beach chair that’s got black fabric, I don’t want to sit on that.” We definitely did not order it but that’s what came in and this is what we’ve got. We’ve got to run with this. I definitely feel for those people who are trying to get things done with factories overseas. I guess a quality reliable supplier makes a big difference. As we’re going through it, we’re trying to solve design problems with the product that emerge once you actually have it and you sit on it and you’re like, “This is a problem here. This is wearing out. I didn’t expect that.” Every time you try to solve the design challenge, you can do it once and because the product is not something we can easily iterate here without our tool techs, it’s hard to account for those changes and the ripple effects. That’s where that lack of ability to iterate stretches things out. Then there are the design trade-offs. There’s weight versus comfort. There’s the ability to fold it up versus how much extra cost is it when you add new hinges. Some of those trade-offs require insight into, “I don’t know what the additional cost is when you add four more hinges.” It’s very difficult to make trade-offs with a product where the iteration cycle is long. Focus groups are so easy to put together these days. On Make48, you can’t have focus groups. For Big Boxers that might be in the beginning stages and they have several different iterations that they’re thinking about and they want to get some advice beyond family and friends, it’s pretty easy these days to put together some focus groups online and get some key feedback to what you’re doing and what people like versus this or that. The other thing is I’ve had a lot of clients over the years who struggled with their prototypes. It takes a while to get it built and it takes a while to get it shipped. Then you get it and it’s not right. It’s just pulling your hair out. At some point, you’ve got to go there. You have to go there and be there with the factory while they’re making some of these changes if you want to save yourself some time. The last thing is when you’re ready to produce, you have to go there again and watch the product come off the line and make sure it’s right otherwise, all kinds of crazy disastrous things can happen. I’ve had a lot of clients that couldn’t get it fixed until they went there and once they went there, things come together easily. You can only talk to each other off schedules. Whether it’s daytime or nighttime there, you have the whole-time difference and then you have the hole that they have to try something to get back to you. When you’re there, you can make those conversations right on the spot and things can happen and so it can get a lot a lot faster. I feel for you guys in that part because it can be super frustrating and time-consuming. The finished product when it’s ready, all those things will have been worth it. We’re working through with the Make48 folks, which on one hand is helpful because they have connections and contacts. Tom has a guy who’s made a chair that had different capabilities, but he’s got great insights. At the same time, we’re working with them and through their folks in some ways. Because of that, there are more people in the loop and that always adds more time and energy to try to get them all on the same page. Brynn, tell me what do you think of the whole process? What is the one biggest takeaway that you have? There have been many and it’s hard to narrow it down. One of the biggest ones that I’ve seen is that collaborative work and communicating and having everybody’s ideas is such a valuable thing. The Wedgy definitely was a collaborative process. All of us contributed to the final idea and that’s definitely something in school and everywhere that I take with me. Maria, what do you think is the biggest takeaway for you? None of us had any type of experience when we took on this whole process. It’s cool that we came together and used our various talents and skills although not including the invention. We won against people who had successful inventions in the past. People who are engineers. People who had done this and do this for a living. It’s super cool that we can all come together with our various skills and make something cool. David, what do you think is your biggest takeaway? The biggest thing for me is enjoying the process. Maybe you’ll make money, maybe you won’t make money. It does take a long time. If you’re not enjoying it, you don’t feel good about it. Do something else. That’s my big takeaway. David and I came in knowing that this a great experience for our daughters. They were heading off to college that year. Instead of fighting over the invention, we always keep in front of our mind that we would keep it fun and also avoid having fights with the family and the daughters. The focus was on the experience. The winning was the icing on the cake. In terms of what I took away, it’s what you can accomplish in 48 hours. To think that they gave us a category that we didn’t know about before we got there and where you end up, it’s amazing how much can be done, especially when you have the support of folks to collaborate with. The takeaway is it’s amazing what can be accomplished in a short period of time when you get folks together and put their minds together. Interesting enough, all great takeaways and everybody saw it differently. Thanks so much, everybody, for sharing your story. The program is currently airing. Am I right about that? Once a week for ten weeks depending on the market. With PBS, the different markets run in their different time. For example, Charlotte was running three days before for Washington, DC. Maria’s down at the University of South Carolina. If you go see the Roku, there’s a PBS app and when you go there, if search Make48, you got the social pop up. We were able to watch it before it even aired in the Washington DC market. It’s very accessible. It’s online at PBS.org. They’re posting the episodes every week now. That’s probably the easiest way to watch it. It’s been a pleasure talking to all of you. I appreciate you guys sharing your experience and I’m so pumped that you guys got first place. That makes it even icing on the cake for me. Well done there, and again thanks so much for being here. What a great show. I wasn’t kidding you. These are great people and everybody contributed. There wasn’t one person on this team that was a lagger. It’s a great dynamic for dads to get together with daughters and do something fun and make something and have memories that will last a lifetime. My hats are off to David, Erik, Brynn and Maria. Well done. You guys took home first place in season two. You guys deserve it. The Wedgy is going to be epic. To our audience, I’m interested to know what you guys thought. I’m interested to know if you would ever want to be on Make48. It sounds cool. It sounds like the team had a good time. Leave some comments for the team. Let them know what your thoughts are. Let us all know if you’d be interested in being on Make48 and if that sounds like something that you would want to do. I look forward to the conversation, I look forward to you commenting and I know that the team does as well. I have a couple of housekeeping things before we sign off. The two episodes that I mentioned before, if you haven’t had a chance to go back and listen to them, are episode 114 and episode 86. Episode 114 was with Rich Brull and episode 86 was with Tom Gray. If you want to know more or you want to see the episodes, you can always visit Make48.com and they have all the episodes on there. They also tell you how you can watch it on actual cable television. Don’t hesitate to go to Make48.com. Check that out and then if you want some more insight into the team, what their struggles were and how it all went, if you want to get to know them even better, you can go to InventionDad.com. That’s David McCutcheon’s blog site and it is awesome. You don’t want to miss it. David McCutcheon is giving a lot of information there and you’ll get to see some great pics of the episodes. If you’re enjoying the podcast, let us know. There are so many different ways that you can reach out to us. We’re @OnTheShelfNow on Twitter. We have @OnTheShelfNow as a Facebook page. We have our On The Shelf “Now” closed group. If you’re not part of the closed group, go to Facebook On The Shelf Now, click on the group and hit join. That way you can have some additional conversation. If you would go to our page, On The Shelf Now, on Facebook and like it, that way you’ll be up to speed on what’s going on and future guests and all that. If you would follow us on Twitter, that would be great. That’s how you can support the podcast. That’s how you can be part of the success of the podcast that you’re listening to. I also want to know what’s going on with you. What’s going on with your journey? What are you into? What roadblocks are you having? What do you want to talk about? Reach out to us. There are several different places that you can reach out to us, like our website, OnTheShelfNow.com. Go there and hit us up. I want to know what you’re struggling with or the successes that you’ve had or a great buyer meeting that you went to. I want to know it all and I’m sure that the others do as well. Thanks so much for being a part of the podcast. I appreciate it. Until we speak again, look forward to seeing your products on the shelf. David – Invention DaD. Team captain. Submitter of the application video. Amateur inventor. Brynn – David’s daughter. Grew up with her father running around the house asking his kids to shoot product videos of him displaying his latest ideas. Humanities magnet high school student (now student at University of Maryland). Creative and artistic. Erik – Consultant (I usually say “Business Guy” because no one seems to know what a consultant does). His brain is an encyclopedia of information and the latest research on most topics. Maria – Erik’s Daughter. Humanities magnet high school student (now a student at University of North Carolina). National History day finalist. Funny and energetic. Thanks, Tim, for having us on! You have been a real inspiration to me and helped me gain insight into the creating and selling process without having had to go through it myself. I’m hoping for another hundred+ great episodes! Thanks David! It was wonderful to meet the entire team and hear all the great inside scoop.